I have already had the opportunity to report on various new problems in Word 2011 linked to the introduction of the new default user interface for finding and replacing text. Today, I’d like to try and describe the new feature as a whole and its impact on my workflow in real-world situations involving real-world Word documents that I have to work on. But of course if the last time you used the sidebar, it was for one of its three other uses, i.e. the Document Map Pane, the Thumbnail Pane, or the Reviewing Pane, then this is the sidebar that will appear by default when you click on this button, unless you use the small control on the right to open yet another submenu and select the Search Pane directly. And this toolbar button is basically in the middle of nowhere, near the middle of the toolbar, instead of being near the left-hand side, where it would be expected to be found, as a control designed to show/hide the sidebar. You can use Word’s customization feature to change the location of the button, but even if you put it all the way to the left, it’s still quite far from the sidebar itself, especially when the Ribbon is visible. Instead, Microsoft had to do its own thing, and introduce yet more inconsistencies and unexpected quirks in the general Mac OS X user experience. More generally, it should be noted that, of all the word processors and text editors that I use, Word 2011 is the only one whose default UI mimics the one in Preview. All my other text writing tools (mainly Pages ’09 and BBEdit, but also InDesign CS5, Mail, TextEdit, and so on) use a dialog-box-based approach. The applications that use a search-field-based approach, with or without a sidebar, are applications that are for reading/browsing purposes mainly, and not for writing: Preview, Safari, iTunes, Mail’s main Viewer window, etc. So why did Microsoft choose to copy that UI instead of sticking with the dialog-box-based approach that appears to be the preferable option for writing tools? The generous answer would be to say that Microsoft is trying to innovate and bring to writing tools the simplicity/intuitiveness of the search UI used for reading/browsing tools. The less generous answer would be to say that Microsoft simply didn’t really think the whole thing through. Based on the numerous new problems and bugs introduced with the new search features in Word 2011 (and the pervasive shoddiness of Microsoft’s work in general), I don’t need to tell you which answer I find is the more likely to be correct. Basically, the reason that writing tools do not use a search-field-based approach has to do with text selection, as we can see by examining how well Word 2011’s new feature performs in the real world. If you had a blinking cursor in the document when you pressed command-F, the cursor will stop blinking and become invisible if you happen to press command-F during the phase when the blinking was off. 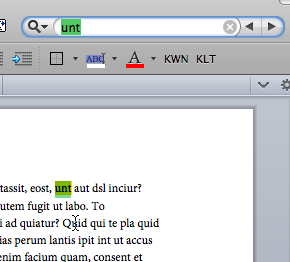 So you won’t be able to tell where your cursor was by looking at your document while the focus is on the search field. If, on the other hand, you had a range of text selected in the document when you pressed command-F, Word 2011 will fail to change the selection colour from foreground selection highlighting (whatever your default selection highlighting colour is in Mac OS X’s preferences) to background selection highlighting (which should be a light shade of grey). Yet more shoddy work on Microsoft’s part. Now, when you type some text you want to search for in the search field, if you had a selected range of text in the document when you activated the search feature, the selection highlighting will disappear and instead Word will display yellow highlighting for all occurrences of the search text within that selected range only (except that you can no longer tell what the selected range was, since the highlighting is gone). Depending on how lucky you are, Word 2011 will also highlight the first found occurrence in your default foreground selection highlighting colour. I say “depending on how lucky you are,” because quite often on my machine the foreground selection highlighting colour appears briefly, but then the colour changes to the yellow highlighting, and you have no indication of where the selection is in your document anymore. If, on the other hand, you didn’t have anything selected in your document when you pressed command-F, after you type something in the search field, Word highlights in yellow all found occurrences in the entire document. If you get no results, you can either press command-F again (or command-A) to select the contents of the search field and type something else over it, or press Tab to return to the document and resume typing. If you do get results, you can browse through them by pressing command-G (next occurrence) or command-shift-G (previous occurrence) repeatedly (or using the arrows that appear in the search field). But always remember that, just because Word highlights the next/previous found occurrence in your foreground selection colour, does not mean that you can just start typing over it as soon as you’ve selected the one you want. No, contrary to what the selection colour indicates, the focus is still on the search field and typing will change the contents of the search field and lose all your found occurrences. In order to go to the actual occurrence and edit it, you have to remember to press Tab to exit the search field first. With nothing selected in your document, press command-F to put the focus on the search field. Type a string that will be found and wait for Word to highlight the found occurrences. Press Tab to return to your document and edit one of the found occurrences. Press command-F again and type a different search string that will be found. Press Tab to return to the text. If you do this, Word fails to keep the last search string in the search field! Instead, it reverts the search field to the previous search string, and of course you lose all found occurrences of the new search string. In other words, it treats Tab like the Esc key (cancelling your last action)! This essential means that you’d better use the mouse instead of the Tab key here. A strictly keyboard-based workflow is impossible, which is rather annoying for a word processor. There are more problems with the search field. Let’s say you have the Search Pane open and you have something in both the Find and Replace fields in the Search Pane. 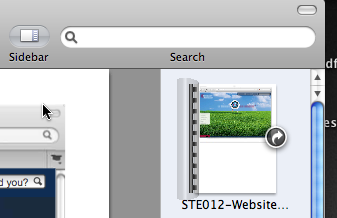 The same text that appears in the Find field in the Search Pane also appears in the search field in the toolbar. I could go on and on like this. But I believe these examples show how Microsoft has once again failed to apply sufficient care to the integration of a new feature in Word and instead, created more usability problems, new bugs, and effectively a loss in usability over what we used to have. Word 2011 fails to use the background selection colour when the selected text is in the background, which creates all kinds of very confusing situations. Word 2011 fails to provide easy tools for controlling the scope of the Find/Replace operations, with the end result being that it’s now harder to restrict Find/Replace operations to a given selection or to one direction only from the current location of the insertion point. In that respect, the very fact that Microsoft felt that it was necessary to keep the old one and simply rechristen it “Advanced Find and Replace” is revealing. It basically means that Microsoft’s developers were unable to design a new Find/Replace feature that was good enough to replace the old one in all possible scenarios. If that’s not an admission of their inability to truly innovate, I don’t know what is. My view is that the very idea of using a Preview-like sidebar was misguided, because the sidebar-based approach is appropriate for reading/browsing tools, but not for writing tools, primarily because of selection and scope issues. But if Microsoft truly believed that this approach was valid and could work, then at the very least they should have implemented it properly with the correct and expected selection highlighting colour changes, and with the required options to limit the scope of the Find/Replace operations, so that this approach could really replace the old one in all cases and perform appropriately in all situations. We are far from this, because such rigour, consistency and reliable usability is beyond Microsoft’s capabilities. I am of course not saying that the old Find/Replace feature was ideal. (It certainly was not, and it did need work.) But the new feature really does not make things any better. It creates more UI confusion, introduces new bugs, and just adds to the general feeling that Word is not a reliable tool suitable for real work in the real world with real documents. This entry was posted by Pierre Igot on Monday, December 20th, 2010 at 7:56 pm	and is filed under Microsoft. You can follow any responses to this entry through the RSS 2.0 feed. Responses are currently closed, but you can trackback from your own site.